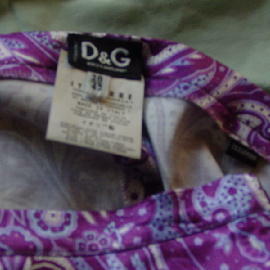 These D & G (Dolce & Gabbana) pants were made in Italy. They are 57% rayon, 40% cotton, and 3% other fibers. The Dolce & Gabbana hologram tag is behind the white fabric tag. 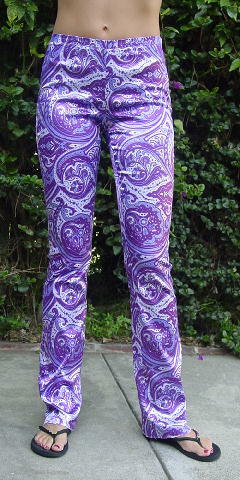 They aren't hemmed, so you can make them whatever length you want. Currently they have an overcast stitching at the bottom. 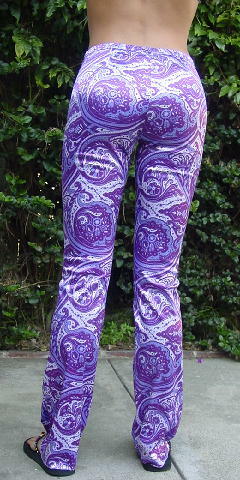 They have a white background with a paisley design in baby blue, light lilac, light magenta, and light purple-magenta. They have a 6" long left side zipper. The tag says they are (Italian) size 42. They were worn once, in a photo shoot. The store tags were cut off for the shoot. The stylist wasn't sure which size would fit the model best, so she bought 2 different sizes. The original price was $150.